Every weekday at noon we offer a non-sectarian silent meditation. We do two sessions of 15 minutes, allowing enough time for people to come and go within the noon hour. Beginners welcome, donations optional. This meditation is led by Bob Harris. Loppon Jamyang will provide a new regular program on the second and fourth Monday evenings beginning in January. Five foundation practices will be studied and practiced, each for about 2 months during the year. 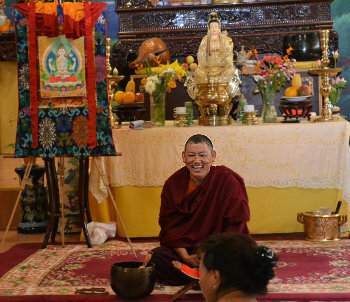 The five are: refuge, prostration, mandala offering, Vajrasattva, and Guru Yoga practice. Ngöndro means 'prerequisite' -- these practices are prerequisites for Vajrayana practice. These sessions are appropriate for any level of student, provided you are interested in intense focus on these traditional Tibetan Buddhist practices. Thursday evening practices in 2019 will have two silent meditation sessions, chanting and discussion. The first meditation may be briefer (10 minutes?) aimed at generating mindfulness. The second one will be a guided session supporting our theme for the year, "Training the Mind, Changing our Self". Guided sessions will cover topics such as lovingkindness, compassion, bodhicitta, exchanging self and others, etc. There will NOT be assigned reading, but Loppon Jamyang may recommend some books as optional resources to review as desired. These sessions are appropriate for any level of student. If you have not been attending Thursdays, please come and check out these sessions to see if they advance your personal practice and life. About half the sessions will be led by Geshe-La. He plans to lead on the first and third Thursdays, with other weeks led by senior practitioners he has selected and trained. Developing the Mind of Compassion. Chenrezi, the Bodhisattva of Great Compassion, is also called Avalokiteshvara and Kuan Yin. Chenrezi responds to the agonies of the world , manifesting 1000 bodies at a time. We practice a four armed form that contains an unusual “Mahamudra” meditation. Through this ritual, we expand our own Compassion minds. Cherezi practice is on Saturdays at 10 am, except on Full Moon Saturdays when we do the Green Tara instead. Lama Lungrik leads this ceremony. Tara symbolizes the Action of Compassion. She is thought to be especially close to ordinary people, and acts to relieve their suffering.The Green Tara practice is done often, especially at the time of the Full Moon. We chant the complete text of a four mandala offering to Tara. Our Tara practice is on the Saturday nearest the Full Moon, and is open to the public.